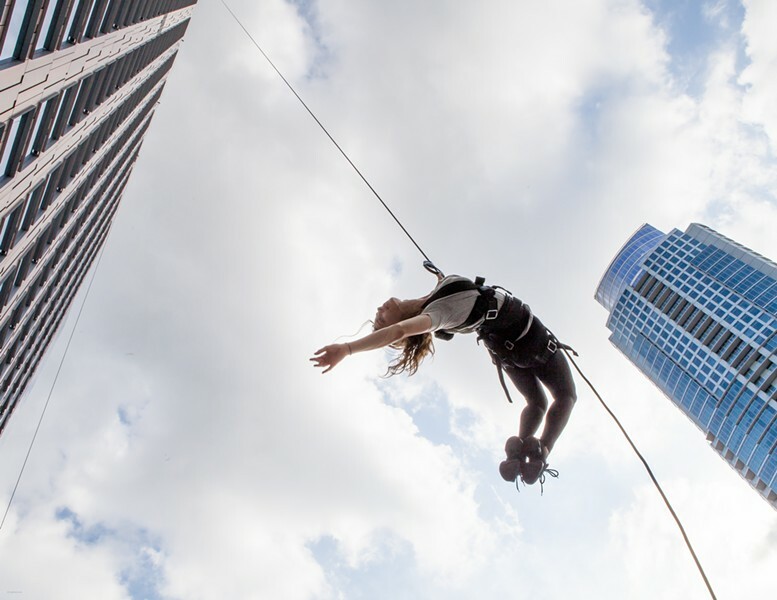 People dancing across the face of Fifth Avenue Place, several stories high: It's sure to be a highlight of this year's Dollar Bank Three Rivers Arts Festival, June 2-11 in and around Point State Park. 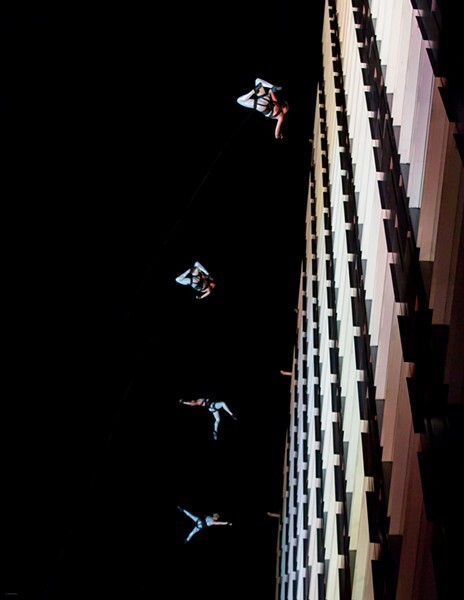 Performers from Austin, Texas-based aerial dance company Blue Lapis Light will be the ones rappeling down the Highmark Building in evening performances June 2 and 3. That show comes courtesy of the Pittsburgh Dance Council, and was announced this past Saturday. 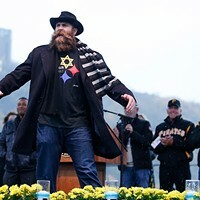 The Pittsburgh Cultural Trust-organized festival's musical headliners were announced in March; arts-fest executive director Sarah Aziz provided the rest of the programming in a press event Downtown this morning. Along with the familiar artists' market, the festival features several temporary public artworks. These include Indian artist Shilo Shiv Sulemon's "Tidal," an interactive "geo-feedback" work in which visitors can activate lights that mimic the flow of Pittsburgh's three rivers. There's also the Umbrella Sky Project, from Portugal, an installation of colorful umbrellas near the festival's acoustic stage, and Riverlife's "to be determined: Take a Seat!," for which the local nonprofit provides 25 movable chairs equipped with GPS along the riverfront, to be used simply for sitting — and to help determine where more permanent seating might be located. While all the Trust's galleries are showcased during the festival, festival-specific gallery shows include the return of DRAP-Art, the Barcelona-based festival featuring art made from trash (that made a successful visit to Pittsburgh last year) and the annual juried show for regional artists, this year with works chosen by Lee Parker, John Peña and Lenore Thomas. The festival will also again run in conjunction with the day-long, arts-and-tech-themed CREATE Festival, June 1 at the August Wilson Center. Other news: There will now be not just one but two Giant Eagle Creative Zones, for kids' activities, in Point State Park and Gateway Center. Likewise, The Anthropology of Motherhood, a quiet space for parents with young children, adds a Gateway Center location to its original Point State Park spot. The music headliners include the Rebirth Brass Band, St. Paul and the Broken Bones, Dawes and Pittsburgh-based acts The Commonheart and Beats + Bars. A multitude of mostly local acts populate other stages and time slots. All festival events and exhibits remain free to attend. Complete festival info is here.